Ben Roethlisberger is a guy who comes to mind whenever someone slams his fist down and throws out a starting record to salute or slam the quarterback they absolutely love or positively can’t stand. Big Ben is a future Hall of Famer. A great player. And, for the record, he’s 142-69-1 in the regular season, 13-8 in the playoffs and, of course, 2-1 in Super Bowls. Like all quarterbacks, no teammate he’s ever had has a won-loss record so firmly stamped on his resume. Sure, bad quarterbacks make boneheaded plays to often lose games. And, yes, good ones sometimes perform heroically to win games. But what about all the many, many games when it’s questionable, at best, to attach a win or a loss to one player in a sport where 22 of them share the field at one time? Best example: In Super Bowl XL, Roethlisberger completed 9 of 21 passes (42.9 percent) for 123 yards, no touchdowns, two interceptions and a 22.6 passer rating, second-lowest in his 15-year career. And HE “won” the game by “beating” Seattle 21-10. At this point last year, the Redskins were 5-7 with Kirk Cousins. This year, they’re 6-6 with Alex Smith, Colt McCoy and Mark Sanchez. At this point last year, the Vikings were 10-2 with Sam Bradford and Case Keenum. This year, with Cousins and his $84 million expectations, they’re 6-5-1 and slipping while Case is 6-6 and surging in Denver. But let’s not use a team’s record to assess a bottom-line, final-answer judgement on an individual. There are far, far too many other variables. As just one important example, the Vikings had only two defenders miss a total of three games due to injury/illness last year. A remarkable run of good health in this league. But this year has been a much different story since Week 3. To the point where Mike Zimmer’s defense played key chunks of Sunday’s game at New England with a punt returner and an undrafted rookie manning the cornerback spots opposite Tom Brady. Cousins has contributed to some losses, for sure. The Buffalo fiasco comes to mind first. But a good example on the flip side came in the L.A. Coliseum, where he was extraordinary in a 38-31 loss that saw the defense give up five touchdown passes and a perfect passer rating. Cousins is 32-37-2, including 0-2 in the playoffs. But how many of those losses did he play well in, and how many of those wins did he get carried? The same could be asked about every quarterback’s won-loss record. In 2015, Teddy Bridgewater’s record was 11-5. One of those wins was a 21-18 overtime victory in which Bridgewater was knocked out of the game early in the fourth quarter and replaced by Shaun Hill, who threw only one pass for a 6-yard completion in overtime. And when the Vikings clinched the NFC North in Week 17 that year, Bridgewater completed 10 of 19 passes for 99 yards, no touchdowns, an interception and a season-low 45.7 passer rating. And got the “win” at Green Bay. And, one more example: Sam Bradford went 2-0 last year. That second “win” came when he had no business being on the field with a knee so weak that he couldn’t adequately protect himself. When he was mercifully pulled before halftime, he was 5-for-11 for 36 yards, four sacks and a 53.6 passer rating. 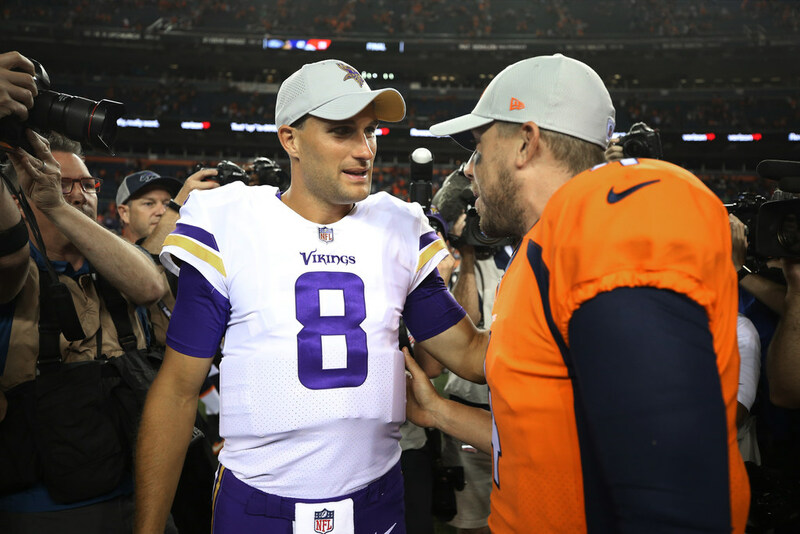 Keenum led the Vikings to victory, but it didn’t go on his resume. Ditto for safety Harrison Smith, who’s late interception set up the short game-winning field goal in the closing seconds. So, yeah, a quarterback’s record can be a piece to the puzzle. Just don’t let it be the only piece. Look deeper into what happened in the games. Better yet, watch the games before looking at the numbers.